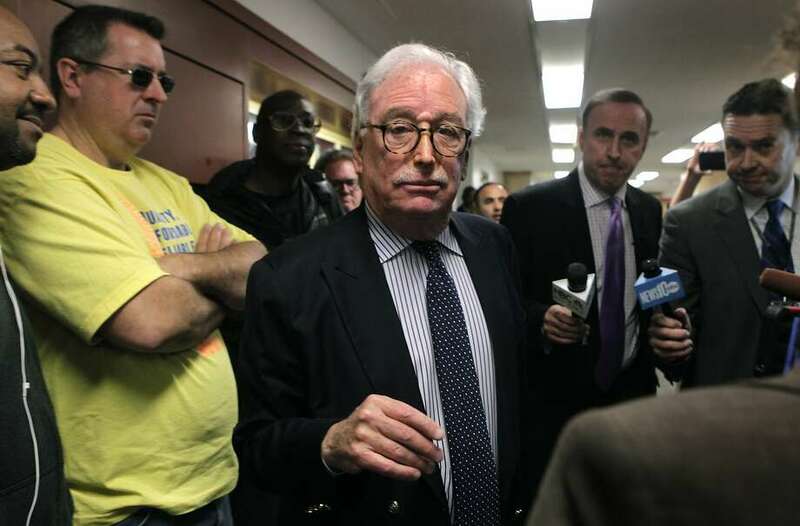 California Public Utilities Commission president Michael Peevey makes his way through a crowd of reporters and onlookers after testifying before the Senate Energy, Utilities and Communications committee at the State Capitol in Sacramento, Calif. on Tuesday, March 18, 2014. A tribute dinner for the embattled former president of the state Public Utilities Commission may have seemed a good way to help bolster funding for UC Berkeley’s public policy school, but the event turned into a nightmare that ended only when the school rejected the proceeds, e-mails released by the university show. More than 300 pages of e-mails — obtained by a San Diego citizens group under the Public Records Act — show how the Goldman School of Public Policy had moved from first welcoming the proceeds from the Feb. 12 event honoring Michael Peevey to rejecting $30,000 and severing ties with him. It was mid-December when Peevey suggested the Goldman school receive any unspent money raised in a charitable dinner in his honor, an event organized by Susan Kennedy, a former member of the PUC, and Don Solem, a San Francisco public relations executive. While Brady later told university officials he was happy to take part in the dinner, he stressed that was before state agents searched Peevey’s home in a widening corruption probe of the agency. Michael Picker, Peevey’s successor at the PUC, was an official sponsor of the affair. As such, commission lawyers said he had to disclose any contributions of $5,000 or more for the event. As the sponsor, such payments, under state law, are considered to have been made at his behest. Picker wondered if a per-person average contribution might negate the state disclosure rule, the e-mails show, and whether he had to disclose contributions from donors he did not actually contact himself. “You will have to do the reporting,” Christine Hammond, the commission’s lawyer, stressed. “I’m not sure that I’ll win any fights about the behesting and will report whatever totals you get from different sources,” Picker said. Brady was not “inclined to withdraw,” Doornbos said, as Peevey had been a six-year member of the advisory board. Besides, he and his wife, state Sen. Carol Liu, had been “significant donors,” with Peevey funding an economics professorship and Liu endowing a post in graduate economics. “Peevey is on our board and he is a distinguished public servant,” Brady added, but the e-mails continued. “I do not want to get into a battle with him in any way (and anything I send him will be put out on the web),” Brady told the official. Meanwhile, Brady sought to assure his own staff and students about the dinner. “There are lots of misconceptions and false rumors about tonight’s Mike Peevey event,” Brady wrote in a mass e-mail just hours before the Feb. 12 gala. After 250 people dined at the Julia Morgan Ballroom in San Francisco, Brady went to New Zealand. But the negative e-mails continued in the days that followed. One came from an unusual source — the utilities commission’s acting chief administrative law judge. Peevey saw himself as a “benevolent dictator” rather than consensus builder, David Gamson, a Goldman school alum, told Brady, adding that Peevey ended up equating his views with the public interest. “This is an opportunity for the Goldman School to 'speak truth to power.’ It will be difficult, but you must succeed for the good of the institution,” Gamson said in his e-mail. “The story you tell makes sense to me and it will help me a lot as I move forward,” Brady replied that Sunday, Feb. 15. The week after the dinner, a Chronicle editorial damned the school’s role as “shameful.” Still in New Zealand, Brady instructed his staff to issue the “standard response” to e-mails, saying that the school did not sponsor nor organize the event. At the same time, he asked his staff for Peevey’s number. But less than a week later, Brady was drawing up an exit strategy. He stressed he would like to maintain his “innocent until proven guilty” approach, but had to think of protecting the school and the university. In a March 10 e-mail, Peevey lamented the “media frenzy” his idea to donate to the school had touched off. By this time, the school had renounced the cash.